The Market is Segmented by Product (Jardiance, Farxiga, and Invokana) and by Geography. The North America sodium-dependent glucose co-transporter 2 (SGLT2) market is expected to witness a tremendous growth during the forecast period (2019 – 2024), with a CAGR of 15.84%, mainly due to Jardiance and Farxiga/Forxiga, which launched globally in 2013 and 2014, respectively. Jardiance is a once-daily oral medication that is used to control blood glucose levels in people with type 2 diabetes. Jardiance has the highest growth among all the drugs in the SGLT-2 class of drugs, with a CAGR of about 21.4% during the forecast period (2019-2024). This is mainly because patients prefer this drug, as it has a lower risk of cardiovascular diseases when compared to other SGLT-2 class drugs. The SGLT2 class of drugs includes Jardiance, Fraxiga, and Inovokana. The market growth for the drug Invonkana has been decreasing when compared to other SGLT2 class drugs, due to a large number of side effects, such as increasing weight and high cardiovascular risks for the patients. In the United States, there are close to 900 lawsuits currently pending, regarding Invokana. Suglat is an SGLT2 drug present only in Japan, with a market value of USD 93.29 million in 2017. As there is an exponential growth of the diabetes population year on year, especially type-2 diabetes, new innovative drugs are emerging in the market, for ease of access for the patients. With this increase in diabetes population, the need and demand for diabetes drugs are expected to increase in North America. The other factors, such as better adoption than other therapies and government initiatives, are driving the diabetes drugs market. United States holds the highest market share in north America SGLT2 market. 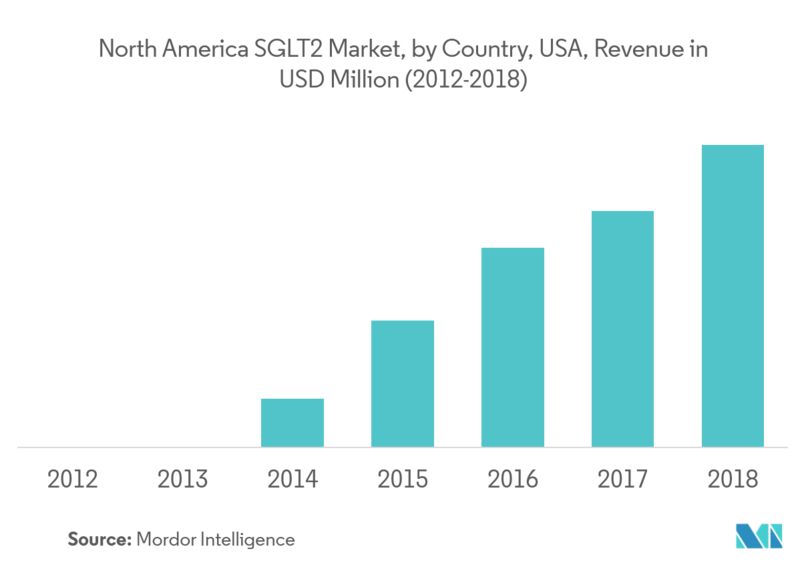 The North American SGLT2 market has a value for USD 4,205.99 million in 2019 and is expected to reach USD 7 billion by 2024, witnessing a growth of 15.56% until the end of the forecast period 2019-2024. 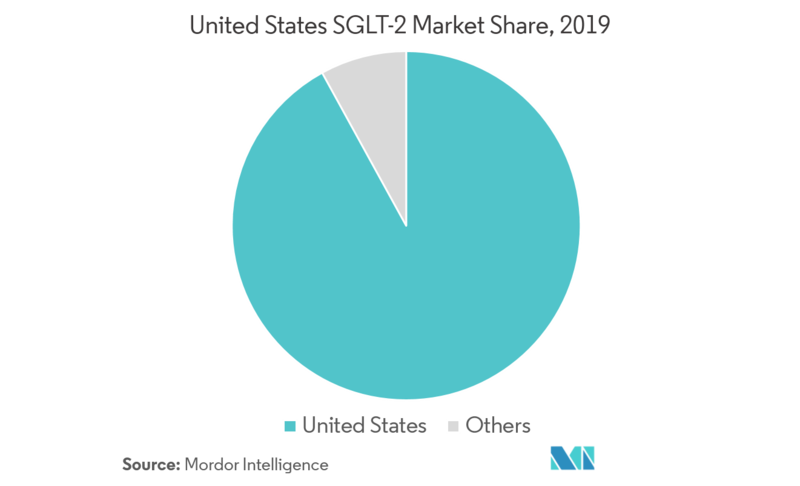 The United States accounts for 96.59% of the market, followed by Canada, which contributes around 3% of the SGLT-2 revenue in 2019. At the brand level, Jardiance holds a significant market share at 43.48% in 2019. Jardiance also has a higher growth rate, at 21.31% which is considerably higher than the other two brands in this segment (Invokana and Farxiga/Forxiga). The high CAGR attributed to the fact that Jardiance was introduced recently and used for other indications, such as diabetes-related cardiovascular diseases. 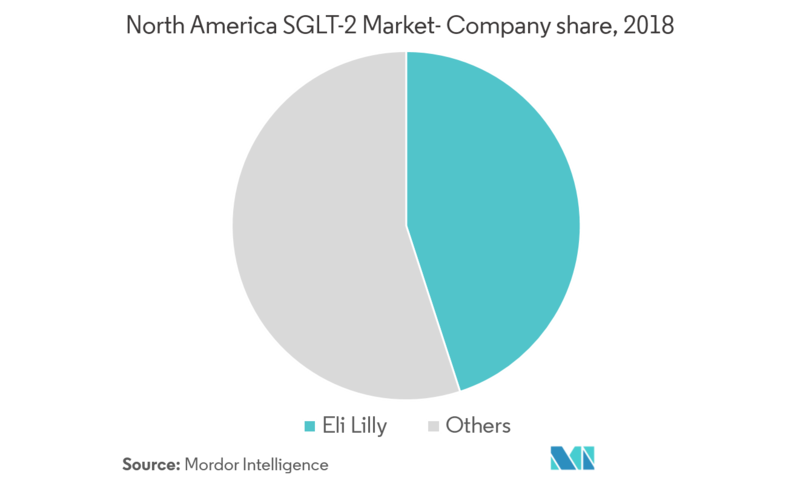 Overall, the SGLT2 market is expected to witness considerable growth, owing to factors such as the rising diabetes population, continuous R&D for the improvement of drug efficiency, and constant updation of labels, among others. In June 2018, a new study on Jardiance reflected that the drug helps in reductions of kidney disease and cardiovascular risk. In July 2017, the European Medicines Agency (EMA) Committee for Medicinal Products for Human Use (CHMP) issued a positive opinion, to update the labels of Jardiance. The labels will now include results from a trial that states that there is a relative risk reduction in hospitalization for heart failure, by 35%, and a relative risk reduction for new-onset or worsening of kidney disease, by 39%.